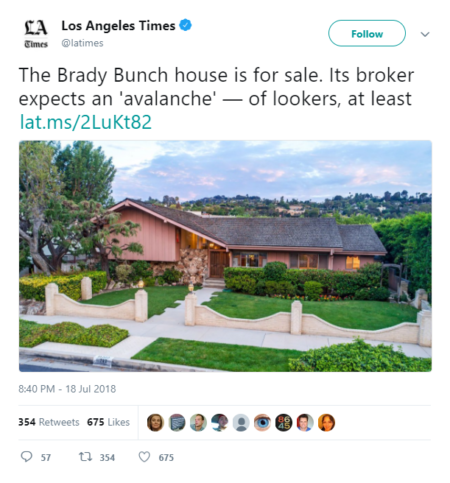 Here’s a story… Brady Bunch house for sale. “In the early 1980s, roughly 60% of all private-sector workers were covered exclusively by [pension] plans. Today? It’s more like 4%,” says Nilus Mattive of Agora Financial’s Rich Life project. If you’re a regular reader of The 5, you know we’ve tackled the issue of borderline-insolvent pension funds… and Nilus is riffing on the same theme. “I expect the number of defined-benefit pension plans to continue dwindling as additional firms look to freeze existing plans, stop offering them to new hires and/or eliminate them altogether,” Nilus says. If the market takes a tumble or a pension-fund manager makes a keystroke error — saying nothing of garden-variety incompetence — pension funds can turn into a quagmire of broken promises and corporate liability. Working from last year’s numbers, S&P 500 companies owe current and future retirees about $382 billion more than they’ve saved. “General Electric is the worst offender,” Nilus says. “Its plan — which covers more than 600,000 people — is underfunded to the tune of $31 billion. While many of these private retirement plans are languishing, “it’s the exact opposite situation for thousands of bankers. 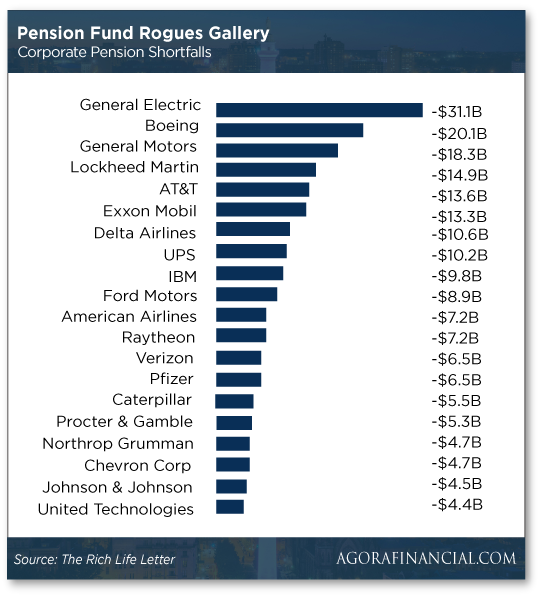 Not only are some of these bank pensions fully funded to the penny, but some are operating with a surplus. In JPMorgan’s case, it was 116.8%. “One of the primary reasons that companies overfund their retirement plans is for the tax benefit of doing so,” says Nilus. But… with the new corporate tax rate of 21% rather than 35%, some bank pension funds are going to start pulling back on contributions. In fact, the 25 largest banks in the United States are looking to increase their dividends by a staggering 25%, to $30 billion, this year. First, he says, “A wave of consolidation is about to hit the banking sector, and that could unlock value for… investors.” Money saved from overfunding pensions and corporate tax cuts can be used for M&A. Not to mention “the larger regulatory environment also just got much more favorable for… banks. “In May, Congress and President Trump enacted legislation that rolled back some of the Dodd-Frank regulations passed in the wake of the financial crisis. “In practical terms, this makes life a lot easier for [some] companies” — allowing them to trade for their own benefit and invest in hedge funds and private equity. “That’s a strong tail wind for banks… because they earn better net interest margins — the difference between what they’re getting on deposits versus what they’re paying out to customers,” Nilus says. [Ed. note: Nilus recently blew the lid off one of Wall Street’s best-kept secrets — one that enables you to pocket $400 in only 90 seconds. Here’s the proof. On to the markets… where Facebook opened down 18%. The social media juggernaut’s not looking so juggernaut-like. Facebook’s earnings report reveals while the platform’s number of users is still growing, it’s sloooowing down. All that to say Facebook’s dragging down the tech-heavy Nasdaq; at last check, it’s down 65 points, to 7,867. But the Dow is adding to yesterday’s gains after a vague handshake agreement between Donald Trump and European Commission President Jean-Claude Juncker to keep talking. For now, the trade war’s on hold — at least on the European front. The Dow’s up another 144 points, to 25,558, while the S&P 500 is still floating above 2,800. Other market movers include Qualcomm — up 5% after the Chinese government nixed its acquisition of NXP Semiconductors (which is down nearly 6%). It’s safe to say the deal would have gone through had Washington approved Qualcomm’s acquisition by Broadcom earlier this year… but the Trump administration killed that deal. Checking in on commodities: A barrel of crude sells for a shade under $70, while gold’s priced at $1,226. Durable goods orders rang in less than expected but still registered their first increase in three months. “China needs to sell its goods and services to the U.S. in order to stay economically viable,” says our income expert Zach Scheidt. With that in mind, investors have been selling off Chinese stocks. “The damage has already been done and the basic assumption is that the trade war is happening.” Zach continues. “So if you invest in Chinese stocks right now, you’ve got limited risk because the idea of a trade war has already been accounted for. If China says uncle, all the better because investors will breathe a sigh of relief and start buying again. “So which Chinese stocks should you be looking at right now? “I’d suggest taking a close look at resort and gaming companies that operate in the offshore city of Macau,” Zach says. “This is one of the most exciting destinations for vacationers in all of Eastern Asia. “The best part is you can actually invest in some well-known U.S. companies that have big bets in Macau.” Zach thinks that’s a win-win situation because you get the safety of a U.S. exchange while benefiting from a rebounding Chinese economy if trade war tensions settle. Both companies are firmly established in Macau and “are extremely profitable, and they know how to set up the perfect destination resort,” Zach says. “Country music legend and cannabis advocate Willie Nelson is working with former speaker of the House and reformed pot prohibitionist John Boehner to upend the pot biz,” says our pot stock expert Ray Blanco. “It’s the pot industry’s newest ‘odd couple,’” Ray continues. In its final round of funding, investors dumped $119 million in venture capital on the pot company. “Acreage is THE prime example for how far we’ve come in terms of public sentiment toward pot,” Ray says. Now Boehner publicly endorses a change in public policy when it comes to marijuana, especially at the federal level. With another $119 million at its disposal, Acreage will be growing its brand with the goal of an IPO on the Canadian Securities Exchange in October. 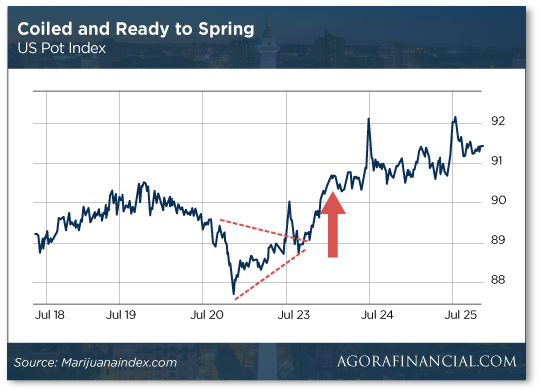 “While we wait to see if Acreage manifests into a buy opportunity,” Ray says, “there’s an important divergence occurring in pot stocks we need to talk about too. “U.S. and Canadian pot stocks are moving in opposite directions this week,” Ray continues. “More consolidation in Canadian pot stocks this week. “The sell-off is hurting,” he says, “but rest assured the long-term trend still holds true. Canadian pot is a high-growth market. “The actual revenue from recreational pot has not priced itself into the Canadian market yet. “When cash starts hitting bank accounts and that revenue is noted on the books, get ready for the explosion,” Ray says. At the same time, U.S. pot stocks look like they’re ready to break out. And several states on the East Coast are *this close* to legalizing cannabis. That’s right, The Brady Bunch house is for sale! Of course, interior shots were filmed in a studio (not to burst anyone’s illusions). “Violet and George McCallister bought the two-bedroom, three-bathroom house in 1973 for $61,000, records show,” the article says. The television series aired from 1969–1974. The home is 2,500 square feet of 1970s grooviness and features wood paneling, a built-in bar and floral wallpaper from the era. “This is a postcard of exactly what homes looked like in the 1970s,” realtor Ernie Carswell says. The iconic home “sits in an area that has been ripe for tear-downs and new development in recent years.” Nooooo! “But the owners will give first consideration to bidders who want to keep the home intact.” Phew. Sing it with me now… That’s the way we all became the Brady Bunch! P.S. People just like you are collecting 72-hour payouts by buying on Friday and selling on Monday. But if you don’t act before 3:00 p.m. EDT tomorrow — basically, an hour before the market closes — you’ll miss out. Learn about the one easy step to take before Friday — to collect big.